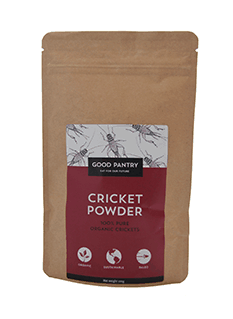 Our organic, sustainably-farmed cricket powder is a protein-loaded superfood. Containing 68% protein, its mild, nutty flavour will add a nutritional boost to the food you enjoy every day. Eat good, do good. It is high in iron-containing more iron than spinach. Iron is essential for healthy blood cells which impact on every part of our health. It is high in calcium- contains the same amount of calcium as milk. Calcium helps your body to build strong bones and teeth, release hormones, clot blood, and many positive impacts on overall wellbeing. The perfect Omega 6:3 ratio of 3:1, as our body cannot make these essential fats we must obtain them from our food to help prevent chronic disease. Excellent source of dietary fibre which our body needs for digestive health among other important benefits such as preventing heart disease. Great source of Vitamin B12, the vitamin that helps to keep the body’s nerve and blood cells healthy. Contains all 9 essential amino acids which are the building blocks of proteins and are vital to health. What’s the big deal about protein I hear you ask…. Nourishing our bodies with dietary protein is vital for health. It supports proper immune function, helps to maintain and build muscle mass, regulates blood sugar and allows for sustained energy. To burn body fat quickly, a high level of protein is required in your diet. As Cricket Powder is high in protein and low in both fat and carbohydrates it is a good choice to include in your fat burning diet. Aside from its advantage in fat burning, it is a good choice to include in your everyday healthy diet to help your body perform at optimum levels.